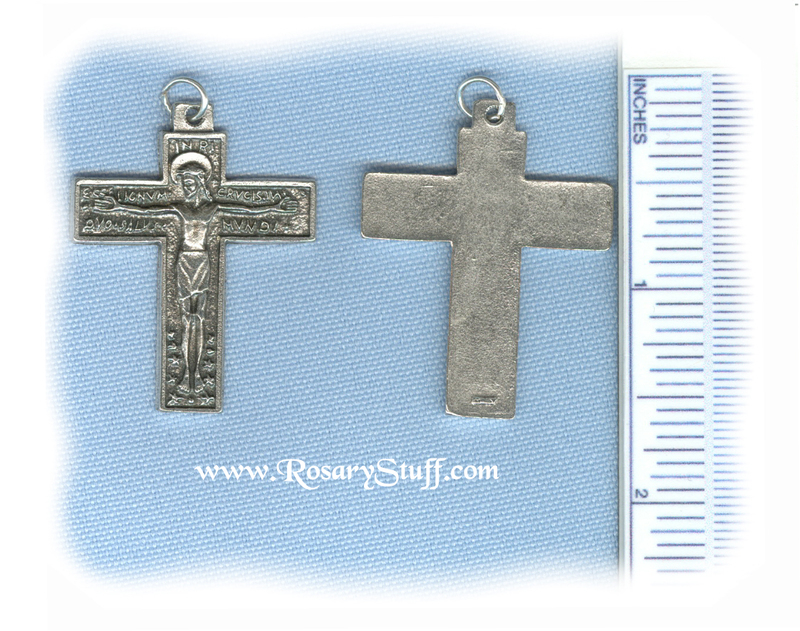 Renaissance Crucifix ~SP~ 1 1/2 in. Italian oxidized silver plate Renaissance crucifix. Sized at 1 1/2 inches tall (including ring) and just over 1 1/8 inch wide. The front of this crucifix has the words "Ecce Lignum Crucis, In Quo Salus Mundi" engraved on it. The translation "Behold the timber of the cross on which Salvation of the world was suspended". These words come from the Gregorian Chants used during Lent and Easter. Click here for more information. This is a copy of a design by famous French designer Fernand Py. Look up his name to see his distinctive modernist style.